Last October I went to the Knit and Stitch show at Alexandra Palace and scored 10 skeins of Artesano cotton for £30. I adjusted the waist shaping and hem, added a moss stitch edging, added the same shaping to the sleeves and added the collar. However, my crafting friends really weren’t convinced by the pooling. Most objecting to the ‘fingers’ over the bust line and hips, other objecting to the change between the bust, waist (where there are no increases) and hem. I’ll be honest it didn’t bother me, but I wasn’t massively attached to the result so decided to try something I hadn’t done before, but for which cotton was perfectly suited. Overdying. It *really* didn’t bleach out the way I expected it to. For some reason I wasn’t expecting pinks! 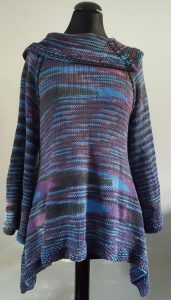 While the picture above looks like a solid hue, it really isn’t – there is beautiful, subtle tonal shifts throughout the sweater that show up in different lights. I took a photo with flash to try and show this, so while the colour is (very) washed out – this does give an idea of the tonal changes… All in all I love it – I’ve had several comments on it while wearing it (including being asked if I frogged the original jumper) and it was a really interesting process. I have worn it A LOT since I finished it (in fact I’m wearing it today). For £30 (well less, I still have 4 skeins left) and the cost of the bleach/dye I am delighted. Have you ever dyed anything? ICE has finally thawed and finished and while I initially wasn’t convinced (I’ll be honest!) I have found myself wearing it a lot the last few days. It’s a lovely wearable shape, and the colour I’ve chosen goes with a lot of things! I think the pattern as written has the sleeve a little short – but that could me having a *much* tighter gauge than the designer (though my swatch came out right). Of course it was also a good opportunity to practice my continental style knitting. I like the knit stitch and will use that again, but I’m really not a fan of Norwegian purl. 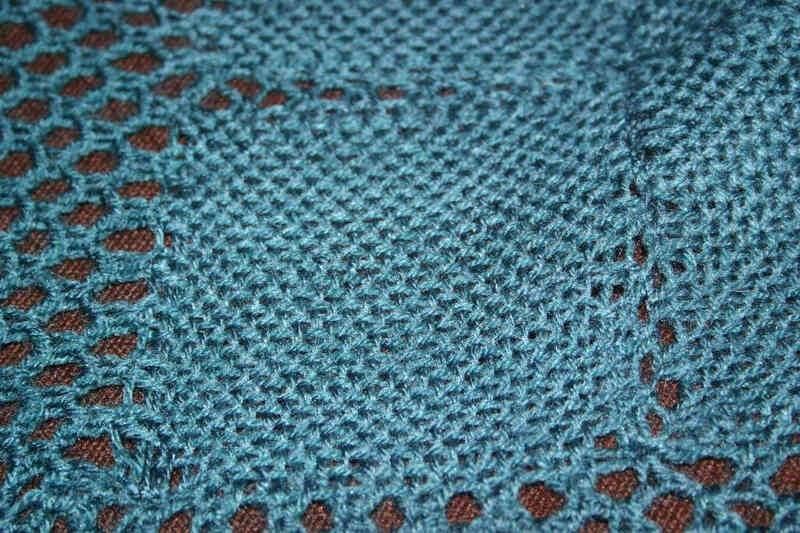 It might make more sense if doing rib stitches, but for doing stockingette it makes no sense at all! I also picked up and finished two (yes TWO!) little crochet projects. After procrastinating for a long time (as regular readers will know I have ideas and then they have to ‘simmer’ for a while) I finally opened my copy of Mary Korinor’s Crochet Lace and did two projects. One is a baby blanket for a work colleague and the other is a stash busting shawl using up 5 balls of kid silk haze “acquired” at a swap meet. Mary has a very interesting approach to her work – including the all important “how much to leave for the border” calculations. Of course Mary was English, and I have made several “design features” out of the fact that I frequently forgot this and mixed up which stitch I was supposed to be doing. I find Mary fascinating in that often she will describe in words the stitches for the centre and inner borders and then give just a chart for the outer/edging border. I found this approach very interesting as charts for the middle section would be very useful, and if you can’t read charts then you can’t finish the project. 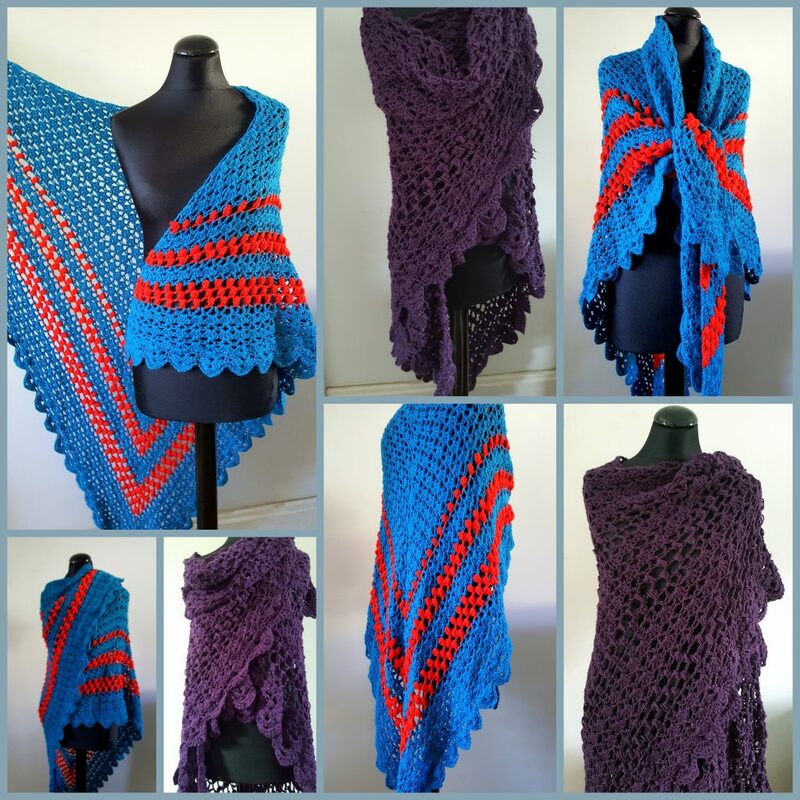 I’m really pleased with how both projects have turned out, and am tempted to just go ahead and do the other shawls in the book out of curiosity – in particular the two ‘granny square’ based shawls as mine are both over 20 years old and starting to look a little tired. I really enjoyed the kid silk project, and am now playing with some stitch variations to work out how to make a capelet shape that hugs the shoulders with a beaded edge. I might even be able to make it a one skein (or two at most) project. I need to dig through my stash and find my fyberspates faerywings as I think it would be particularly gorgeous in that. I’m about to come to the end of my current contract and have a few weeks while I job hunt. 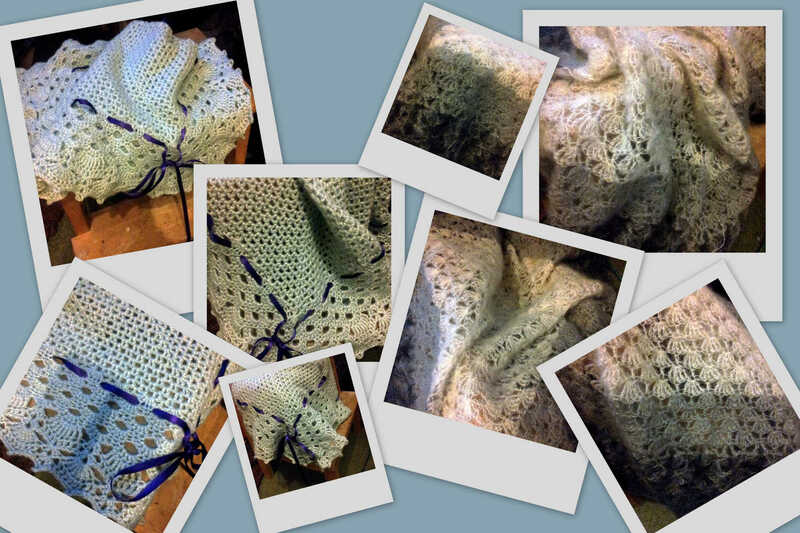 During that time I plan to write up some of my patterns and publish them – so watch this space! I made the mistake of thinking BOTH these exact thoughts last Thursday as I completed the last round of the cuff of my ICE shrug – just the (ok, uber long but crochet) middle edging to do, two and a half hours commute craft time, plus a long drive on Sunday morning (with me being passenger) so I’d be able to block Sunday evening and wear this on Wednesday! At which point a small wormhole opened and sucked that reality into an alternate dimension. “Trying it on” for the benefit of some work colleagues for who a shrug is a new and novel concept (let alone making one) I decided that the sleeves were a bit short. The edge of the cuff sat on my elbows, so the bottom edge sat half way down my forearm. It just looked small. I had got gauge on my knitting (if anything a little loose!) and I had done the right number of rows. No problem, I’ll just take out the second cuff, undo the bind off, pick up the stitches and knit another 6” onto the body. Fine. It won’t add that long to the job. I’ll still be finished for Friday. I unravelled and unpicked and picked and knit. 4” in I had a look and realised that somehow my tension had become more relaxed. MUCH more relaxed. Suddenly I had a piece of knitting with something approaching a fishing net attached to one end. This thing suddenly looked like I had handed it to my 3 year old niece for knitting practice. That’s ok, I thought I can just work the extra yarn out of each stitch and feed it up though the knitting row by row until it comes out at the top. Those of you who are “good” knitters will know what a stupid idea that was. 20 minutes and 1 row later I had an extra 18 inches of yarn sticking out one side of my project (see told you my gauge had got really loose) and I had come to a rather interesting conclusion. It was going to be faster to rip it out and re-knit that section. So my commute craft time this morning was spent frogging and picking up stitches. Again. I have six inches of knitting to do, then the cuff and then the middle edging. Not going to be done by Friday. Completed Projects – sometimes, it takes time! 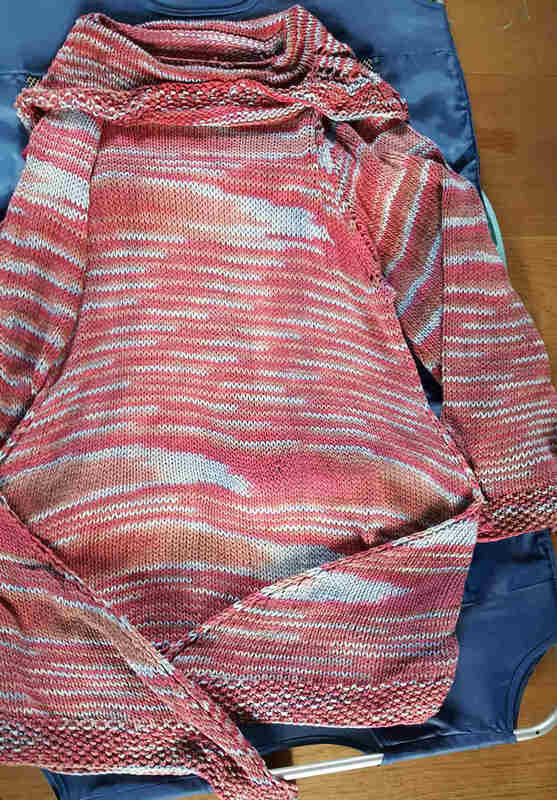 The complete sweater – the image top right is probably closest to the true colour of the yarn. 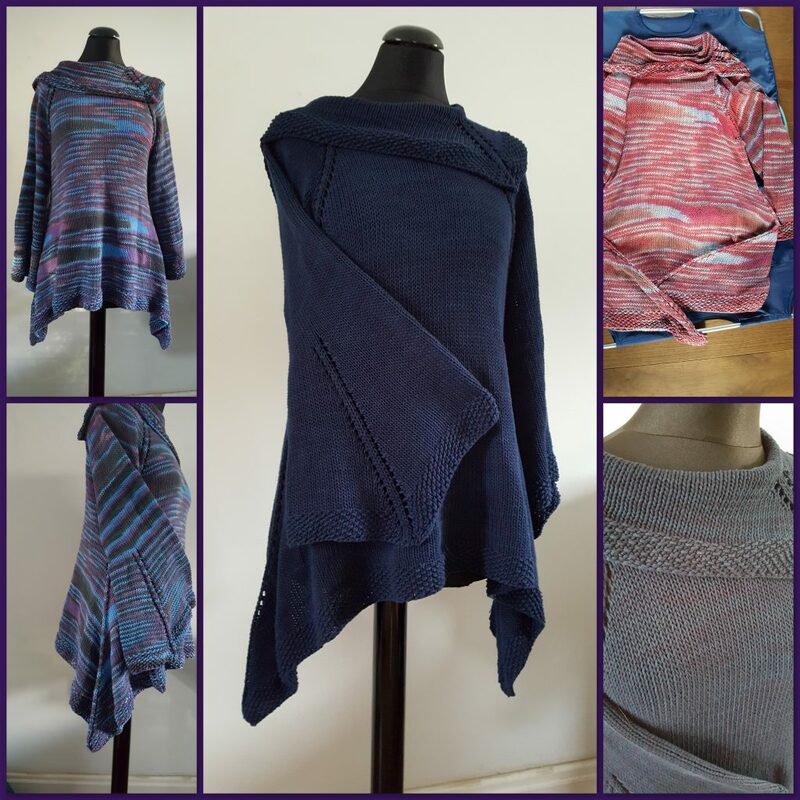 I had fun doing this sweater – and you can see in the bottom left photo how the top is a little baggy in the back, as I mentioned last week. Though we have discovered that if I have less than perfect posture that ‘bagging’ vanishes! 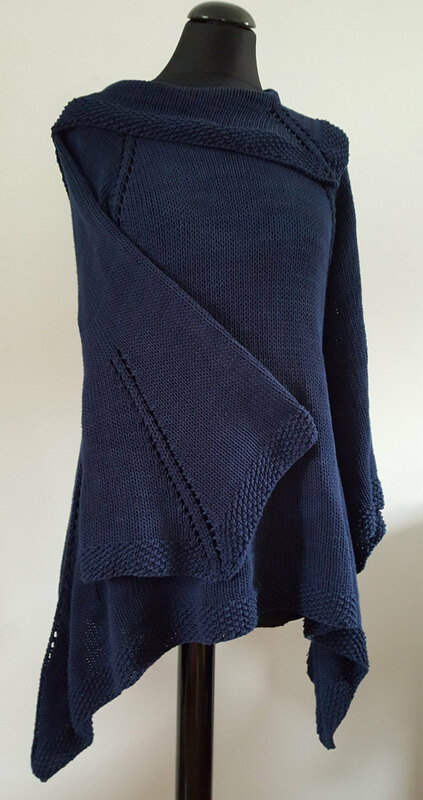 At the recent Purlescence open day I also bought some beautiful buttons and some French Navy pure wool sweater yarn to finish the 1963 Twinset. For those of you who don’t know the story of the 1963 Twinset, pull up a chair and get comfortable. A friend of mine turned to me about three years ago, and (knowing my interest in vintage) asked if I would be interested in finishing a project. 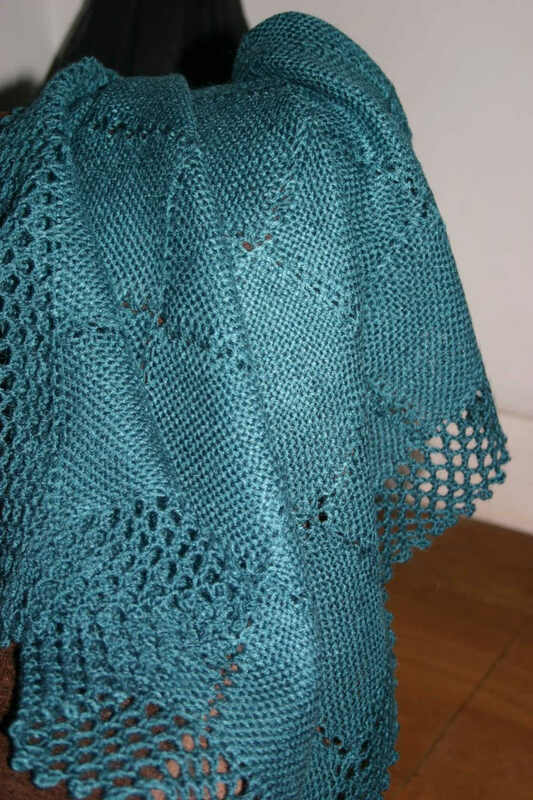 It turned out that a friend of hers – a wonderful older lady with a name at least at interesting as my real name had started knitting a twinset and had never got around to completing it. 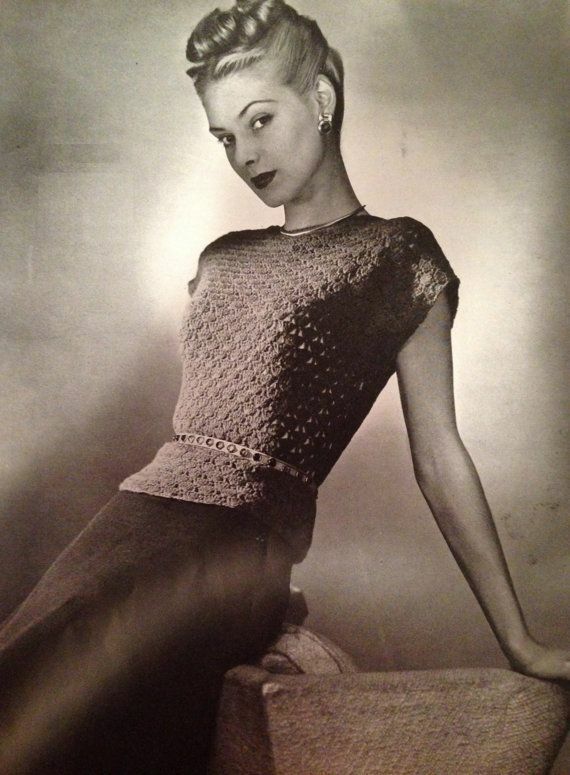 The pattern she had used was a 1957 pattern, and she had started knitting this twinset in 1963. Now, before you think this wonderful lady is an incredibly slow knitter, that’s not the case. She ran out of yarn for the placket and collar and put the project aside in early 1964, from whence it made it’s way into the attic and there it had remained until three years ago when it was handed to me. 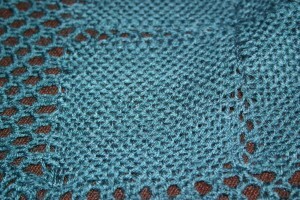 This twinset is a work of art, the tiny stitches are so even the effect is almost of a machine knit. The darts on the top are almost invisible to the human eye. I can’t find any ends where the balls change over – just the cast on and bind off tails… and the whole thing is knit in the most amazing pillar box red. It’s this red that created my challenge. There was no way I was ever going to match this shade of red (in fact the original knitter had tried and failed – hence it’s long purgatory) so I was in a quandary as to what to do? The 1963 twinset sat in it’s box while the problem sat in the back of my head. Pondering. When I heard that Purlescence were now stocking Jamieson & Smith 2ply pure wool I knew I had potentially struck gold. The next open day I could make I took the 1963 twinset with me and spent a few hours on the floor with each of the 40 shades – too brown, too orange, too ‘Christmas’…. There were some surprising combinations that worked (burnt orange and bright red anyone?) but that weren’t in keeping with the period and there were several combinations that should have worked but didn’t (red and black?! why wouldn’t red and black work?). The moment we paired the French Navy magic happened. If my life had been a Disney movie there would have been singing birds, delighted squirrels and sparkle dust. Serendipitously, Textile Garden were also there with their lovely buttons. lots of hunting and coo-ing (and extraneous buttons that I didn’t really need later) I had 10 lovely little cream buttons with a vintage navy blue abstract design on them. 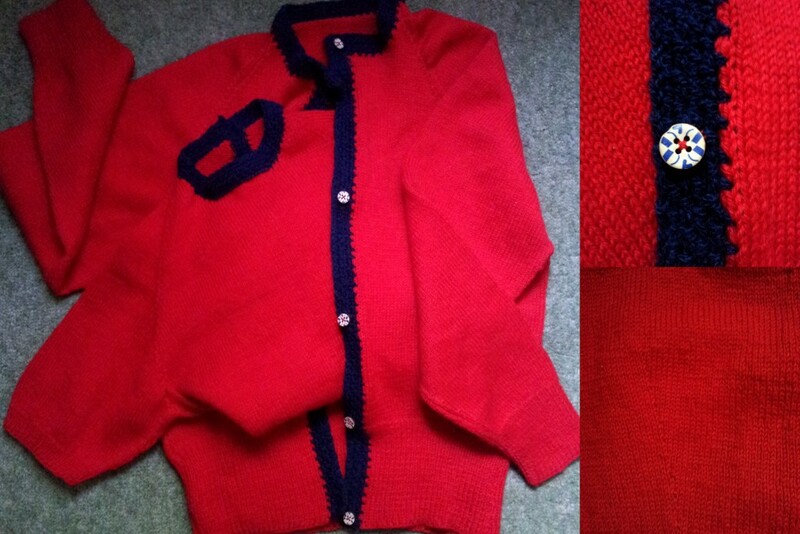 So now I had yarn and I had buttons and I had a vintage twinset that I was terrified of ruining. 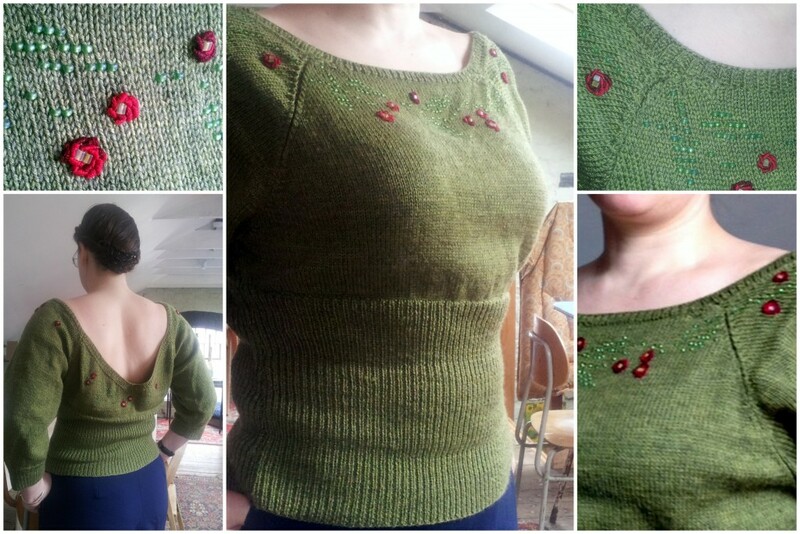 The next morning I added a gravel stitch placket and collar to my lovely twinset. The next day I added the lovely buttons. And now all I need to do is give it a rinse in some lovely SOAK to full the new wool a little and refresh the 50 year old yarn. I have realised I also need to buy a navy pencil skirt or wide-leg 40’s style trousers to wear with this creation, but truly? it’s a small price to pay. I can not wait to wear this out, and I am so proud of being able to finish this project (which, co-incidentally fits me perfectly) and do the original knitter justice. 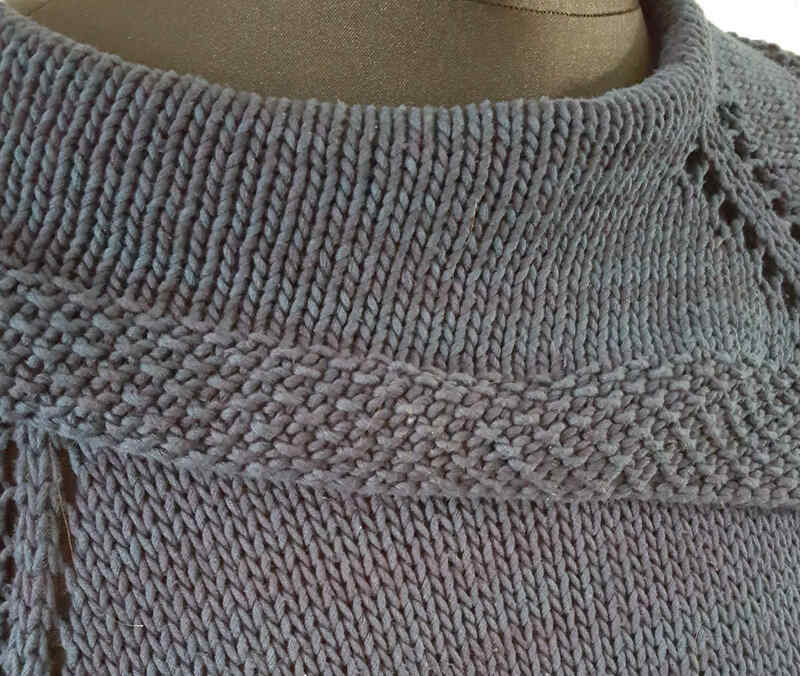 I also have plenty of yarn left over – so I’m wondering if I also crochet a detachable collar for the sweater… hmmmm…..
Well, after (literally) years of promising I finally got around to putting up part 3 of the chart reading tutorial as web-pages as well as PDFs. I split the PDF into two sections, and reworked (slightly) the second part about reading chart only instructions (for example those pesky Japanese charts). The PDF is still the original version so the wording and charts are very slightly different. 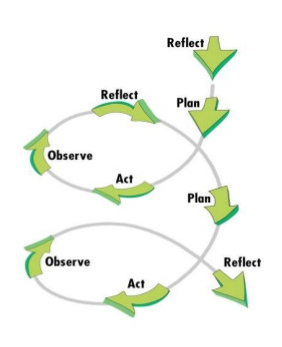 Part 1 – getting started, what those funny symbols means and working out what you are supposed to do with them. You’ll need a hook and a bit of spare yarn as we’re going to make a small sample together. 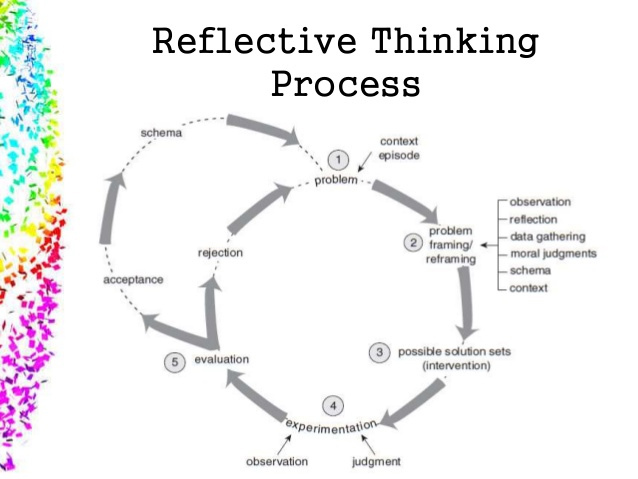 Part 2 – continuing where part 1 left off, getting further in our sample. Part 4 is coming soon and deals with working in the round. In other news, this week I started a new job. The commute is a bit of a killer though with an hour and a half each way. On the positive side this means plenty of time to get some knitting done. “Repeat last round 117 more times. So – how firmly am I stretching? To the limit of the ribbing? why don’t we have a “or about x cm unstretched” Have you tried counting rows in cobweb weight yarn? I get the feeling I’m going to be doing this for a while longer. I’m currently at 21cm unstretched. I’ve also started ICE in a denim blue cotton (there’s really not enough to photograph yet). I’m mentioning that project here as I’m trying to work it in continental style in order to practice picking (being a natural thrower). The knit stitches I’ve kind got down. I’m not really enjoying it yet (my left index finger gets quite sore from the tip of the right needle rubbing it – anybody got any tips?) but I can see how the knits would be faster. For the purl rows I’m tending to find myself using the Norwegian style, but it feels clunky and long-winded with lots of extra, unnecessary movement. However, “proper” continental purl with the yarn in front drives me mad as I can’t get the yarn to stay wrapped around the needle tip. Long story short: I’m enjoying the pick method of knitting, but want to use Portuguese style for purling. More research needed on the different methods of purling continental I think. So, light on the images this week – sorry. Hopefully I’ll have some photos for you next week of a progressed Tirrold and an ‘assembly pack’ of Garland as I have about 20 beaded rows to do on the final sleeve before I can start sewing it together. Two posts within a week?! What is going on? Well I promised you an updated on the Zoom Loom I told you I had purchased with my Birthday money (because, as I’ve already said I am fundamentally 6 years old). I’ve had chance to have a play and I can honestly say it is fun. I’ve ended up with a ‘summer weight’ baby blanket – which is perfect as an acquaintance is about to have her first child. Each square is 4″ (unsurprising really given it’s a 4″ loom) and takes about 9 yards of yarn (depending exactly on what fibre you are using – I was using a bit less for the acrylic above, and a bit more for the 100% cotton I tried) and after a bit of practice it does indeed take about 15 minutes to create a square. The blanket is 30 squares (5 x 6) and a border ending up 24″ by 28″. The only thing I’m not overwhelmed by is the process of joining the squares together. Using the suggested “whip stitch” method looks a bit untidy to my eye (particularly at the junctions and corners) and a single crochet ridge won’t work either. There are suggestions in various places of crochet inserts and other sewing methods so I think I need to try some of those.